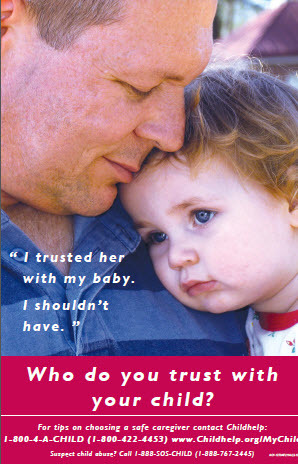 Who do you trust with your child? 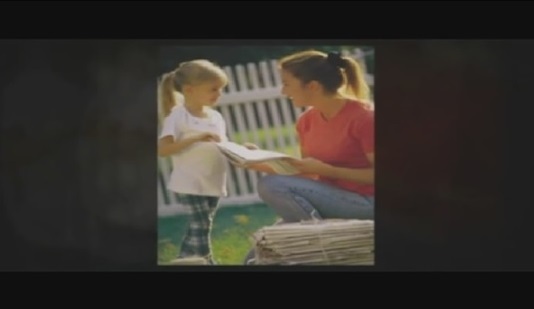 Arizona has seen an increase from 51 child maltreatment deaths in 2008 to 70 in 2010, that’s a startling 38% increase. Tragically, many of these children died at the hands of unsafe caregivers. Sometimes parents don’t plan ahead or think it through. Other times, they rush to trust someone who is untrustworthy. An unsafe caregiver could be a boyfriend or girlfriend, a neighbor or even a relative. If you are a parent with concerns about your child or your child’s caregiver, call the hotline now: 1-800-4-A-CHILD (1-800-422-4453). Please consider these simple tips and warning signs before deciding on a caregiver for your child. Think before you trust. A little planning could save a precious child. Is aware of safe sleep practices – babies can suffocate if they sleep face down so they should always be placed in a crib on his/her back with no blankets, crib bumpers, toys, or pillows that might interfere with breathing. Visit Healthy Safe Baby for more explanation about Safe Sleep guidelines. Is aware of Shaken Baby Syndrome. For more tips talk to a highly qualified counselor who is available 24/7 at the Childhelp Hotline 1-800-4-A-CHILD (1-800-422-4453).